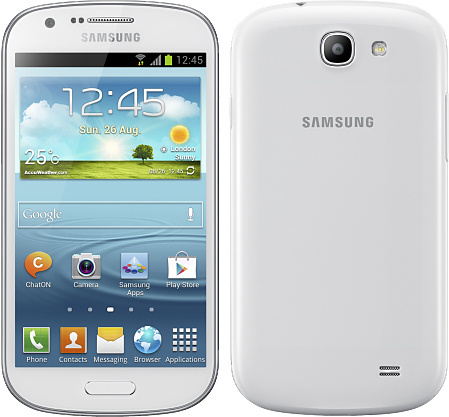 Sitting a couple of places down the range from the Galaxy S III and sitting very closely to the Galaxy S II plus, the Samsung Galaxy Express is a big-ish, fast-ish Android smartphone that forms part of Samsung's bafflingly large family of handsets. Headlining the features is the relatively large 4.5" display with a fairly modest resolution of 480 x 800 pixels. One the back is a 5 megapixel primary camera with 1080p HD video recording, with a 1.3 megapixel one on the front. Inside is a 1.2GHz dual-core processor with 1GB of RAM and 8GB of flash memory. This is an LTE-capable device supporting 800, 900, 1800 and 2600 MHz frequencies, and it also supports HSPA+ if you don't have access to LTE. The Galaxy Express also comes with NFC, Bluetooth 4.0, WiFi, GPS and GLONASS plus all the normal Android 4.1 features and the usual bunch of Samsung enhancements on the top. Inside is a fairly large 2000 mAh battery, and the Galaxy Express measures 132 x 69 x 9.3mm and weighs 139 grams. This particular Korean smartphone looks like just about every other Samsung on the market, in much the same way that Korean cars tend to be almost indistinguishable too. It looks like a decent midrange smartphone overall, but as with many other recent Samsung devices it is a bit.. well, boring. Its sibling, the Galaxy S II Plus currently retails for about €360 SIM-free, we would expect the Galaxy Express to come in at slightly more than €400, and although Samsung haven't said when it will be out, we would expect to see the Galaxy Express in the next few months.